Software System Safety Support to Oshkosh Defense » A-P-T Research, Inc. Employee Owned. Providing Safe Solutions. 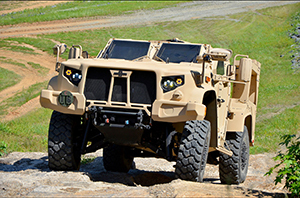 During 2017, APT provided software system safety to Oshkosh Defense for the Joint Light Tactical Vehicle (JLTV). APT provided technical expertise and guidance to ensure software hazards and risks were identified and mitigated. The software safety process developed and implemented at Oshkosh ensures safety and enhances the performance of the JLTV to provide protected, sustained, networked mobility in multi-mission environments. Copyright © 2019 A-P-T Research, Inc. All rights reserved..